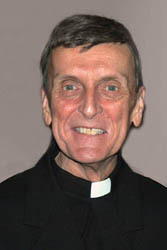 Brother Stephen P. Goguen, A.A., 70, died Saturday, April 19, in the Assumptionist Center, Brighton, after a long illness. He leaves his Assumptionist brothers and nieces and nephews. He was professed as an Augustinian of the Assumption on February 28, 1960. He served in community assignments as a teacher, administrator and formator at Our Lady of Lourdes Minor Seminary in Cassadaga, NY, at Incarnation Parish in Tampa, FL, at Assumption College in Worcester, at Saint Anne’s Church and Shrine in Sturbridge and at the Assumptionist Center in Brighton. He was a trustee of Assumption College since 1982. The funeral was held on Wednesday, April 23, at 10:00 AM in Saint Anne and Saint Patrick Church, 16 Church Street, Sturbridge. The Rev. Dennis Gallagher, A.A., Regional Superior, was the principal concelebrant. Among the concelebrants were the Very Reverend Marcel Poirier, A.A., Provincial Superior of North America. Burial was in Saint Anne’s Cemetery, Sturbridge. Homily at the funeral of Brother Stephen Goguen, A.A. The memory of Steve that will be fixed in my mind for as long as I live – perhaps for some of you as well – is an open door, with him sitting behind his desk in his office. The enduring power of this image has to do with the fact that he was almost always there, and he always had time for you. When Steve said to a number of us that he did not wish to be first remembered as a finance man, he meant by this, I think, that whatever happened when a person walked into his office and sat down next to his desk was more important than whatever he was doing behind that desk. And he always made you feel that way. Steve would be the first to say that this did not make for a particularly exciting life, at least according to the conventional meaning of that word. I recall that on the occasion of Provincial Policy Retreats, the first night of which was given over to speaking personally about one’s life at that moment, Steve would often remark that there wasn’t all that much to say, that his life was pretty boring. Some of this was Steve’s typical self-effacement, but there was something in that self-characterization which probably should be taken at face value. In retrospect, I do think in those years he found his life lacking something important. However much we all had reason to be grateful for his willingness to take up the treasury responsibilities at several different levels, for Steve this was not what gave definition to his life. This may have been obscured had it not been for the last six or seven years of his life, when – I think it’s fair to say – Steve found his stride. (The irony of the fact that this should have coincided with the beginning of a “loss of stride” for him in a physical sense should not be missed.) During these last years, if you will forgive me this expression, Steve became a kind of “poster boy” for the apostolic priorities of the Congregation: for outreach and formation of young people and young religious, for the alliance between lay people and religious, for internationality – all of these brought together in the realization of the dream of a true Assumptionist Center. This was the spiritual and apostolic wind in Steve’s sails during this time. How he loved this project and gave everything he had to it. And for stretches of time, what an interesting place this Assumptionist Center had become, reflecting as it did the very face of the Church, with Asians and Congolese, French and Germans and Swiss, and more Poles than you could shake a stick at… with law students, theologians, chaplains, nurses, hotel waiters and ecumenical scholars, with a theater guy thrown in for good measure, all under the same roof and all striving to be a genuinely Christian community – with Brother Stephen, for as long as he could, the glue that kept all this together. And so, when Steve’s condition took a turn for the worse last fall and a decision had to be made as to where he would live out his last months, there was little question as to what Steve wanted: to return home to his community of brothers and to live out as fully as possible the religious life to which he had always been faithful and for which he had acquired a new-found love. The community’s willingness to care for him was a source of tremendous consolation to him, and I would be remiss if I were not to thank the Brighton brothers for the love they showed to Brother Stephen in recent months, often at sacrifice to their own projects and schedules. Late last Friday night, this devotion culminated, as it was described to me, in as beautiful a moment of community as could be imagined, with religious brothers and members of the extended Assumptionist Center family surrounding Steve’s bedside, accompanying him as he labored to take his last breaths. The Gospel that Steve wished to be proclaimed on this day helps to further illuminate his journey of faith. This, in two ways. John’s was the last of the Gospels, significantly different from the others, reflecting as it did a level of reflection marked by a progression at one and the same time toward greater simplicity and greater profundity. I was thinking of this in light the trajectory of Steve’s life and the movement toward a clear and deep sense of purpose in these last years. Simply put, Brother Stephen desired to pass on to others what he himself had received in his own life as a religious and as a child of God, thus echoing the Trinitarian logic at the heart of John’s Gospel. John’s Gospel is distinctive, too, in its presentation of the cross and glorification of Jesus as one single movement. Those who had the privilege of accompanying Steve closely during the past year were able to identify something of the same in him. His days were not without spiritual darkness - I have asked myself in the past few days whether the prolonging of his days was due to a strong will to live or to a reluctance to let go. The difference between these two is perhaps never clean cut, but in the early minutes of last Saturday, he did allow himself to surrender his hold on this life, hearing as he did an off-key rendering, choked a little by tears, of the “I am the Bread of Life” song that he liked so much. And so, at the risk of being maudlin, take a deep breath, gentle and kind brother, allow yourself to be filled with the freshness and power of God’s Spirit, who desires to lift you into that communion of life and love beyond every constraint of this, our mortal condition. May you breathe forever deeply.